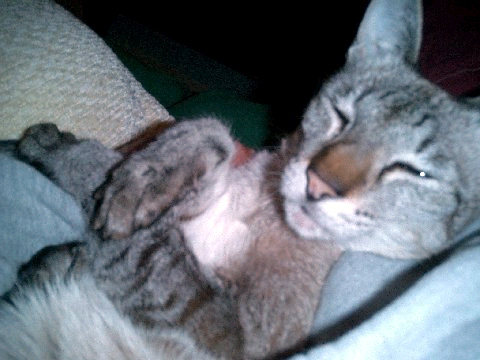 AND FOUND TO BE FREE OF LEUKEMIA, FIV AND FIP! 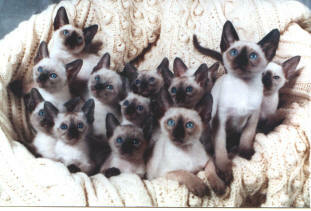 Five Siamese Kittens are Ready for your selection Now! 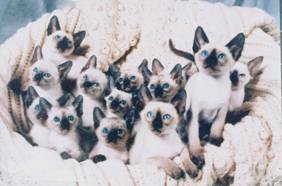 Siamese Connection has been loving, caring and dedicated to breeding Traditional, Classic and nice wedge Siamese, Traditional Burmese, Traditional Tonkinese and Traditional and Classic Colorpoint Shorthairs since 1982. 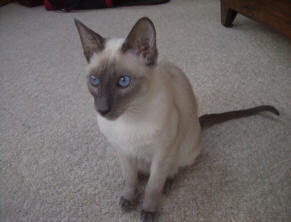 Jim and I started raising Siamese from Shady Paws Cattery in New Hampshire in our own way by doing what we thought was right. We visited a lot of breeder’s homes and found that they didn’t do things the way we did. 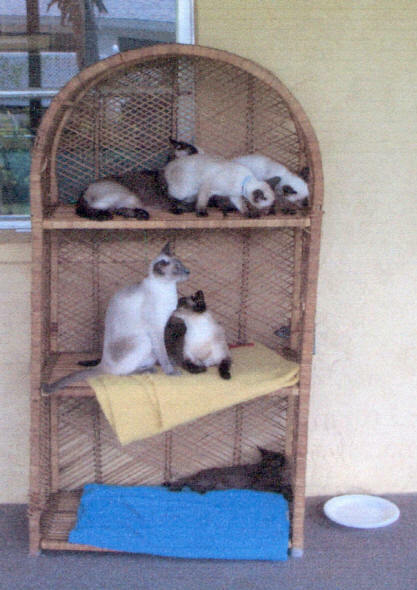 Our cats run freely in our house naturally, except our males. Each male has his own separate, very, very large Tokyo home within our own home. Birthing time is a very special time for all of us. Moms and kittens are kept together in our bedroom. In fact we love to have a baby on our bed with us. 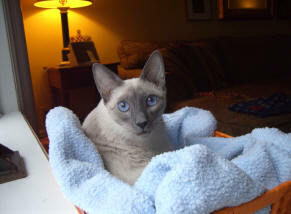 One of our first Moms, Frosty, had only one kitten, so I fixed a basket with an electric pad included inside it and put it right beside my bed. Well, Frosty had other ideas that resulted in her and her kitten sleeping in our bed for six weeks. We treat our babies, both old and young, with great respect and a lot of love. We breed for bone structure, eye color, health and sweet, loving natures. We really mean health too! Our cats are very well adjusted and happy. 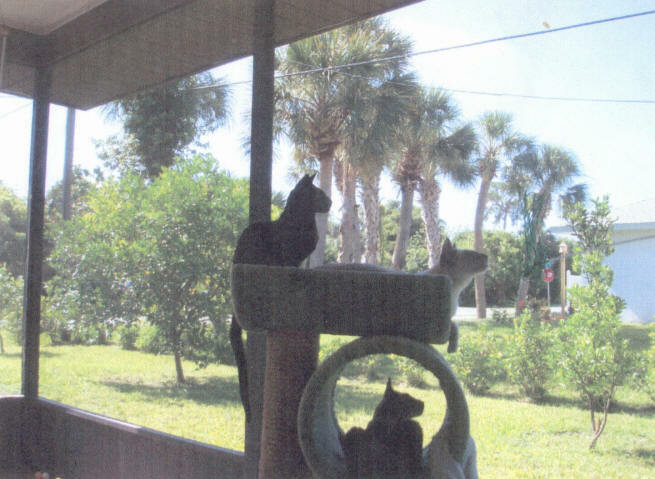 Our home has a large, completely screened porch – Lanai, which is left open during the day, when we’re home, for the cats to go in and out of. Once their day lounging and playing is greeted by the evening, everyone is brought in for the night. Usually all of them head for our bed. They love Jim’s spot now that he is gone. But he’s watching. When Jim passed, I really didn’t think I could go on. I had altered a lot of my males and found good homes for them. I was just lost big time. My son, who lives in Florida, asked me to come down and get out of New Hampshire. So I moved to Florida, bringing four of my males and five of my girls with me. I bought a house and started my life again, without my wonderful husband, Jim. I have a special rapport with the kittens and their Moms. It was as though they were taking care of me and trying to fill the place of Jim. When I married Jim, I told him I married him, because I wanted to wake up with someone pretty sleeping next to me. I feel the same way about my babies. They have just taken his place in my bed. It was the start of or the continuation of Siamese Connection again. Living in my home is just great. There is no stress, only playing and enjoyment. My philosophy is that cats are gentle, loving and very unique, with needs of love, attention and someone to play with. My belief is they are not commodities to be housed in sheds, a garage or in rooms with cages from floor to ceiling. I acknowledge them as living, breathing, precious companions who are to be respected and given the very best care possible. We do not consider ourselves as breeders, but as raisers of cats. As such, they are very important to us, and we care a great deal about them. Five or more generations of our breeding are furthering the cause to bring back the original body type of each breed for future generations to enjoy. Thank you so much. Please tell Laura how sorry I am about Jim – and let her know how much joy she and Jim have given me and my family. I know I never sent stories of Glory back to New Hampshire, but Izzy’s disposition is a tribute to them both - her “birth parents” - the most loving, smart, funny, acrobatic, heat-seeking missile of a cat that ever was. My girl was diagnosed with salivary adnocarcenoma in October and was given a great prognosis – 3-4 years with treatment…so we went ahead and started…and she was amazing…she went through it all with her infamous quirky sense of humor, love of chicken - and grace. She succumbed after 7 months on April 10th at 5:50 PM as the sun as setting - she was 13 ½. Izzy changed my life forever and in so doing – so did Jim and Laura. I’ve thought of you often and could feel the love you gave those babies…from the cartoons on the TV in their room to the platter of food in the middle of the bed, to the colored hair-bands around their teeny white necks. I remember Laura telling me on the phone she had one kitty left – with really big ears…I’ll take the one with the really big ears…and as you can see by her pictures, she grew into them…really beautiful huh? I have one of those digital frames to put all her photos in…and I can watch my shining star all day. I’m so lucky to have found you once and even luckier to have found you more than a decade later – to thank you for the joy you brought to our life. The beautiful Matt Stone kitten pictures are the only thing that’s made me smile in a month and now the opportunity to tell you how much you change the world. Thank God for you Laura – and Ellen for getting us in touch. Shipping is available through two airports, either Sarasota, Fl, or Fort Myers, Fl. Depending upon weight, kittens can be sent to their new families at 10 weeks or older. All Veterinary Health Certificate, carrier and air fare expenses are the responsibility of the purchaser. Please make prior arrangements in advance for this service. Kittens are $400 and up, with adult cats finding new homes under special arrangements. Our cats and kittens are registered with TCA, INC. CFA and CFF. We have plenty of references. 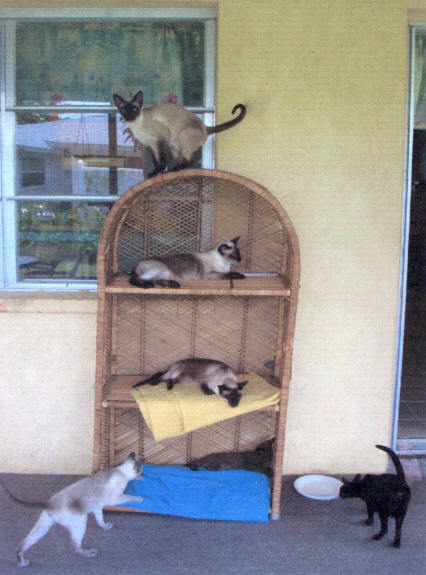 Our Veterinarians are, Dr. Janice Gilkison, DVM at the Englewood Animal Hospital in Englewood, FL. AND Dr. Andrew King, DVM at the Cat Hospital in Sarasota. 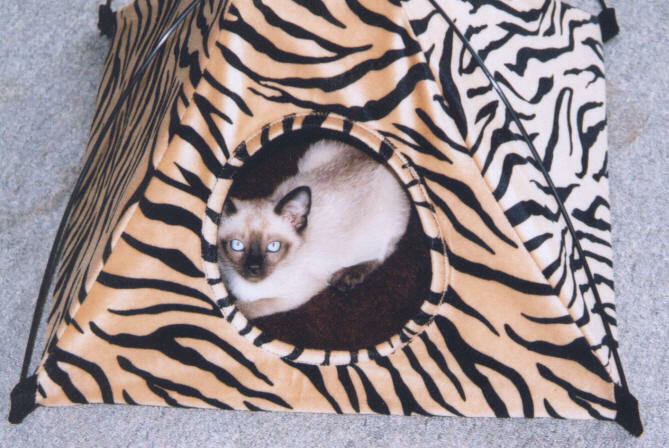 Love and caring are the focus for our cats, so customers can expect to be asked questions about their future Siamese Connection kitten’s living conditions, family specifics and everything relevant, including the customers Veterinarians name and address. We’re always open to customer questions, updates for kittens and inquiries so please call or write. Copyright 2004 All Right Reserved. 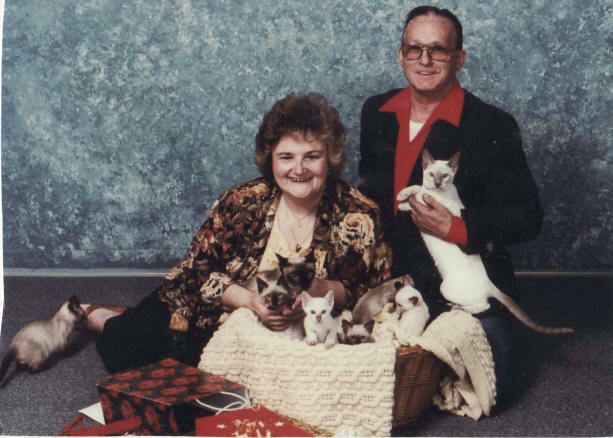 Leonard's Siamese Connection and Tullycrine LLC.